I got in to a debate with my friend last week about whether cash or credit card encourages it’s user to spend more money. My stance is that cash does – definitely! I find that the second cash enters my pocket, it’s gone in 60 seconds. I feel like it’s free money, because it’s here today, gone tomorrow. I don’t have to worry about logging onto my bank account and paying the bill when it comes to using cash, so it removes the pain of feeling it leave my pocket twice. My friend said the opposite. She was convinced that using a credit card fosters spending carelessly more than cash does, because you don’t have a physical entity to part with. Your wallet still feels just as light when you use credit card, instead of cash, which you start to feel separation anxiety after parting with. On a credit card, if you forget what you spent money on, you can pull up your banking records online in seconds. Even if you don’t have online access to your credit card, you will likely get a paper statement at the end of each month, which is a nice reminder of what you spent your money on. However, with cash, you have to remember to keep the receipt, which many people struggle with. If you’ve ever had your wallet stolen, hopefully you didn’t have any cash in it. Unlike credit cards or debit cards, which can be cancelled by calling your bank, cash can’t be replaced if it’s stolen. Many people hesitate to buy something for less than $10 on a card, for whatever reason. Many companies actually charge extra to use a card on a purchase under a certain amount, because the retailer incurs a fee for utilizing the service. Because of this, cash can be more conducive to picking up a pack of gum or a lottery ticket when you are waiting in a lineup. It’s easier to break a five or pull out some coins than it is to think of using a card. It’s easier to pay with credit or debit card than it is cash. You just pull out the card, punch in a pin, and you’re done. No need for waiting for change, counting it out, or visiting the bank or ATM to withdrawal cash. At restaurants, the card is whisked away and a receipt delivered. Furthermore, there’s the new swipe-pay technology which allows you to literally just swipe your credit card over a sensor and not have any other hassle – who wants to pay with cash and go in and receive change when you can just swipe a piece of plastic? If you aren’t a person who pays their credit card bill off in full every month, you will have to pay interest on the balance, which is one of the biggest negatives about a credit card. This can make it more dangerous, too, because you don’t have that issue when you are paying with cash. Regardless of what the evidence shows, it’s important to know yourself and know which one makes you feel more comfortable and which is worse for your spending. We are all individuals and all have different triggers for careless spending. Which do you find worse for spending – cash, or card? I don’t have a problem overspending with credit–I never have. But cash used to lure me into impulse buying because the money was already out of my account and therefore, in my mind, already “spent.” I went virtually cash-free for several years before I got over that! Good debate. I used to think credit was the evil and allowed me to spend more. It actually did allow me to spend more. Now that I have fixed that problem, I know cash gives me the nasty impulse. If it is in the wallet, then I don’t mind moving it out. It is the small purchases that we don’t think about and those add up quickly. It is cash! It is one of the reasons I no longer carry any cash. Definitely credit. It’s just so easy and doesn’t feel like I’m “really” spending – til the bill comes in! While I was raised to be wary of credit card spending, so much time is spent on managing digital accounts that I find I am better with plastic than cash. Go figure. 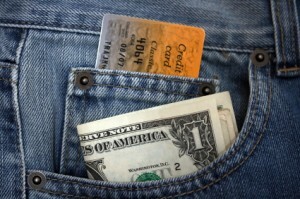 I have discipline with money, so I prefer credit cards for convenience and tracking. Cash is higher maintenance! I would say it depends on any particular individual and his/her spending habits. For me, credit card is convinient but I lose track of my spendings. Hence I prefer cash since I am not good at maintaining track records. Good debate I must say! I don’t have a problem with cash. I get a set amount per week and when it’s gone, I’ll have to wait until next week. If it’s gone in 60 seconds, then I’ll have to wait longer. We use cash for groceries and discretionary spending. Yeah, it’s a bit funny, but our grocery store only take cash or debit. The only thing which i believe is “Don’t spend the money which don’t have” unless and until it is extremely important. Honestly, the “safe” one for me is my debit card. It has all the advantages of a credit card, in that I can quickly look up my balance, it automatically keeps records of what I’ve spent and where, and it’s replaceable if stolen or lost. But it also doesn’t let me spend money I don’t have and there’s no worry about interest rates driving up my final cost, so it’s cheaper and more accountable than a credit card. Cash seems to slip away a bit easier. I generally don’t have an idea of exactly how many bills are in my wallet at any given time because I carry cash so rarely. When I do use cash and get change, it gets thrown in my piggy bank or the change drawer of my car, which admittedly is a nice way to find some “extra money” every couple of months. So I use debit for my day to day expenses and for purchases that get recorded on my budget. Cash comes to me rarely, so when it does, I just use it to treat myself to a small something fun. I hear ya – it definitely also depends on how often you experience the thrill of having cash – or a card, in some people’s case. Yes, it’s not bad in paying with cash. Just so also everybody knows that if you also get a chance of using credit cards, it is good that you are aware of the proper practice in credit financing. Credit cards interest rates are high especially for those whom they foresee as bad risk. It’s just the same if you apply for a business loan or a personal loan. If banks doubt your capacity to pay, they will charge higher interest if ever your loans get approved.